By default, Gmail shows emails from you using the name assigned to your account. 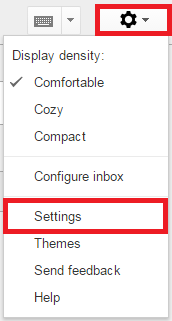 However, you may choose to change this displayed name through Gmail’s settings. Login to your UCA Gmail account. At the top right, click the gear button, and then click Settings. In the Send mail as section, click Edit info next to your UCA email. In the window that opens, add the name you want to show when someone receives an message from your UCA email. To finish the process, click Save Changes.